This is perhaps one of my favourite pubs, because no one knows it was there. Shown left, is a superimposed picture of the Nelson Hotel in today's modern South Street. It may appear a little cramped but that's how things used to be. 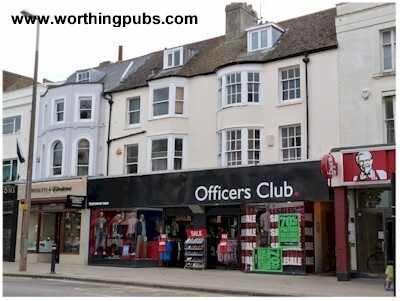 Retail premises these days seem to require huge amounts of room and so the ground floors where knocked together allowing the Officers Club a double frontage. Today's modern shopping high street bears little resemblance to days gone by unless you manage to look above the shop facades. The bay windows of the Nelson remain but other than that there is no clue as to what used to be - unless you know where to look. 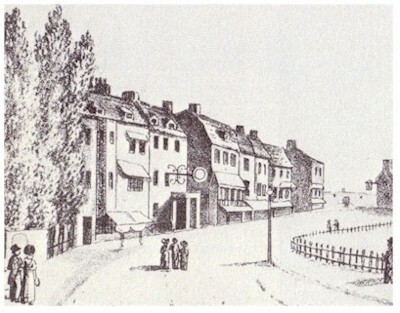 Left, a drawing from 1820 showing The Nelson with a large protruding sign. At this time the Nelson was a coaching Inn, remaining so until 1842. The building on the extreme right was the Sea House (second rebuild). Note that the view from The Nelson would have been that of grazing land as Worthing was only just starting to develop as a holiday destination. At this time, the sea still had occasion to flood the town and stories have been told of customers of the inn leaving by boat! Worthing became a town in 1803. The Nelson become a meeting place for the new town commissioners from 1803 to 1812. You could say that this is where modern Worthing was planned. Looking at the first picture in this set, you might have spotted the alleyway to the right of the Nelson. Just above this is a painted sign shown on the left here. 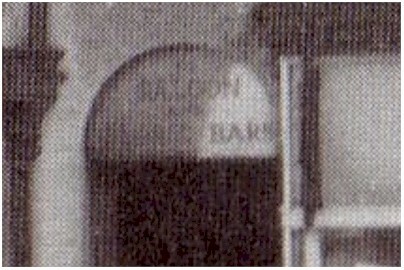 The text reads 'To Saloon and Public Bars'. The Nelson at this time had become a Hotel, providing a more respectable living for the owner, a better class of clientele or simply, more money, but this could mean losing your regulars. The solution would be to have the best of both worlds and so the pub moved to the rear. These adaptations were commonly known as 'Shades' or 'Taps'. Another advantage was the ability to be able to serve beer on a Sunday to travellers in a hotel. The official name for the alleyway is Nelsons Passage. "There was an old shanty here called The Nelson tap, the proprietor of which was the original Jarvey, over the door was a board having written - Fine Purl at 7 O'Clock - I asked my father the meaning, he said - Gin, Beer hot or 'Dogs Nose"
Purl: a drink popular with the working classes, Winter ale infused with bitter aromatics, orange peel and wormwood. 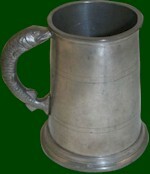 Dog Nose: Porter, stout or strong ale mixed with a small a amount of gin, sugar and dusted with nutmeg. The first clue was this census entry for 1871 that shows a 'Shades' in Marine Place at number 39, directly behind the Nelson Hotel. (the number 69 is the entry number not the building number). The occupier was George Fillstone, listed as bar manager. There have since been other entries as 'Shades' or 'Taps' at the same address. So, we have written evidence, what we need now is physical proof. 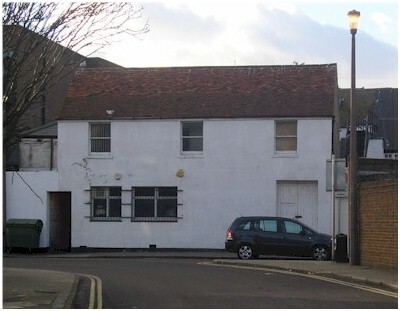 Left - Marine Place, the back of the Officers Club. Could this building be the Shades? Nelson Passage is on the left. The plot of land belonging to the Nelson is large at the rear, this is common as most hotels had to supply stabling for the horses. This for me is the clincher. Down the passage on the Nelson side are three bricked up windows and doorway. 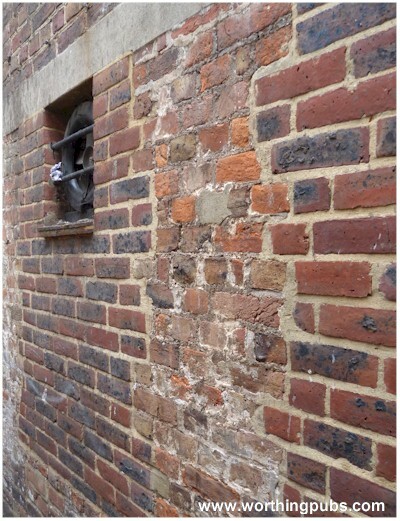 Here you can see the original bricks; very rough hand-made multi-coloured bricks in high contrast to the modern regular brick. The modern bricks clearly mark where the windows were. 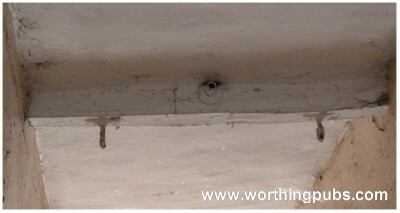 In the covered part of the passage on the ceiling, is this rather curious wooden beam. It has two hooks and an old light bulb fitting. Was this another sign for the bar? This map of 1899 shows the Nelson, the passage and the rear in Marine Place. Many of the buildings behind have long since been knocked down to make a connecting road between Marine Place and Bedford Row. Did Henfrey Smail get it wrong? 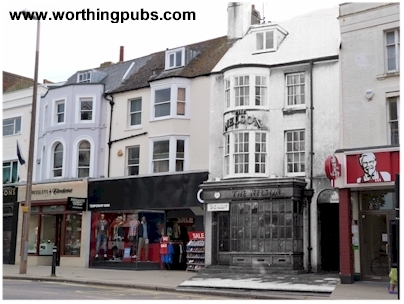 Mr Snewin places the Nelson Inn on the south side of the Nelson passage, the premises now numbered 38, and formerly occupied by Mr Farncombe the butcher, but there is no evidence that it ever stood there and within living memory it has always occupied its present site'. The Nelson Inn is without question positioned at number 40 South Street, however, all is not as it seems A little investigation reveals that Mr Swenin was right all along. Taking a stroll up the passage, we can see above our heads some unusual architecture. A curious angle stretching across from one side to the other, north to south of number 40 to number 38. This I believe to be the bottom of a small flight of steps, two at most, with a small landing. It is clearly, in my mind, a connection between the two buildings. 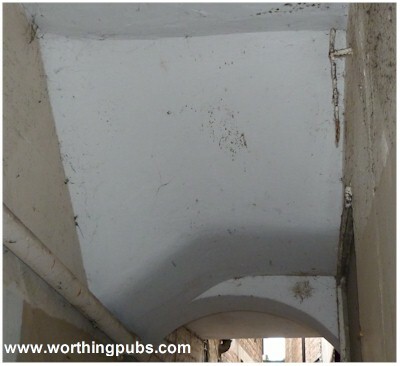 The answer is, that the hotel, whilst probably above the butchers shop on the first and second floors, would have had access via the Nelsons entrance at number 40, up a flight of stairs to a right angle turn and over the passage in to the next door building. I think this diagram makes it a little clearer. 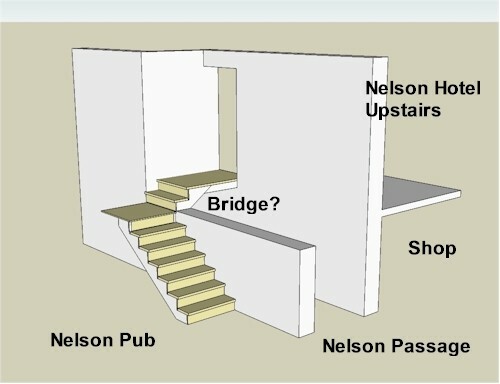 In our minds all the evidence points to a bridge between the two buildings crossing Nelsons Passage. Both sides are no doubt bricked up respectively, but I would bet that there is a sealed void in the structure shown in the picture above. If it were ever opened up I would imagine we'd find a couple of steps inside. Clarissa Stent, daughter of Charles Stent the landlord of the Nelson Hotel was to marry James Greenyer the landlord of The Norfolk Arms.